Shot in late September 2012 by John Richmond. 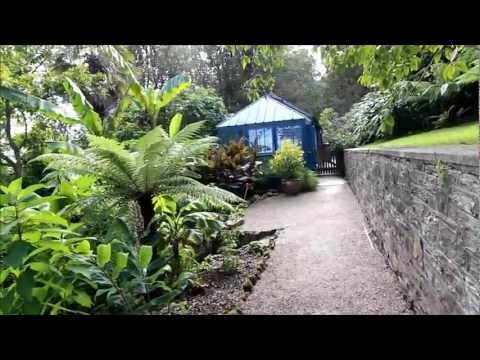 An exotic and fascinating hidden treasure perched high on the cliffs above Salcombe. Explore the banana garden, meander through the woodland, or relax beneath the palms. Walk along the coast path and soak up the spectacular panorama across miles of beautiful coastline and estuary. Continue your journey of discovery into the Edwardian seaside home of eccentric scientist Otto Overbeck. See his amazing invention: the 'rejuvenator'; hear the polyphon, a giant Victorian music box; and be intrigued by the eclectic collections of natural and maritime history. The perfect day out for families who enjoy exploring, or the keen gardener who wants to be inspired and excited. Overbeck's is situated along a beautiful road that winds up along this panoramic stretch of coast. Please note this is a country lane which is very narrow in places.